The FAS SPrint Revolution Bagging System brings new levels of speed and versatility to demanding packaging environments that require daily washdown procedures. 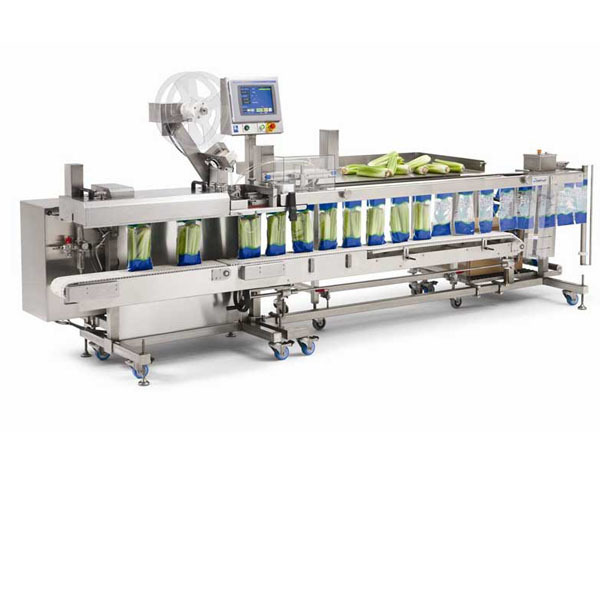 Operating at speeds up to 900 inches per minute, this state-of-the-art packaging system is designed for the ultimate in bag packaging flexibility, functionality and reliability. Engineered to satisfy high-productivity requirements, the FAS SPrint Revolution presents a conveyor of pre-opened bags that are staged for immediate loading. The 60" wide load area features a 6" pass-through, and tilts vertically for easy maintenance and sanitation. An innovative Coordinated Motion Seal Flattener is coupled with a band sealing system to ensure high quality, airtight, 3/8" bag seals. The system operates in continuous, intermittent or batch modes, and cycles on pre-set parameters, or manually with a footswitch. This highly flexible design accommodates one or more operators or infeeds and a wide variety of products and bag sizes. An integrated Allen-Bradley® control package, featuring Kinetix® Servo motors and drives, a CompactLogix™ L45 PLC, and a large, 10" PanelView™ Plus HMI, is designed for ease of operation, serviceability, integration, and overall system reliability. Programming of all components is done with a simple flash card. The AutoTouch™ Control Software displays real time productivity data and provides easy access to job storage, job recall and on-board system diagnostics. Genuine SidePouch® bags are system-matched for optimum performance, and offer a variety of value added features, such as reclosable zippers, resealable plastic bags, reinforced headers and tamper-evident perforations. Since the bags are pre-made, costly machine modifications are not needed to utilize these features. SidePouch bags are available in an assortment of materials that can be pre-printed in up to 10-colors with high-resolution graphics, text and bar codes for unique, attractive packaging with a competitive edge. W 2 to 20 in. L 3 to 18.75 in.